Hi! 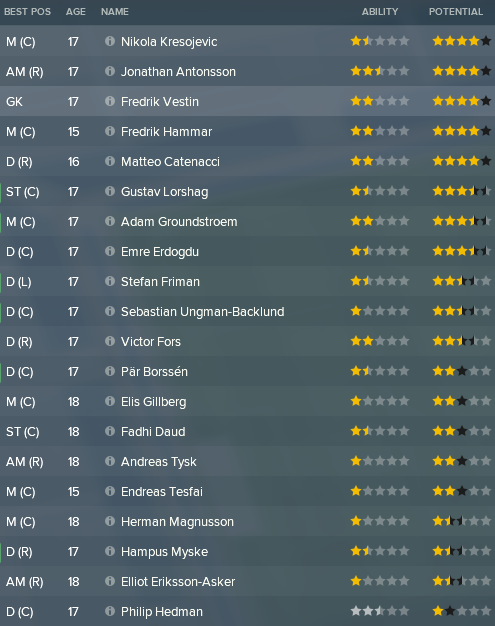 MikaelinhoFM here with the second episode of my first ever FM18 blog “The Bromma Boys” about Swedish talent factory Brommapojkarna. Firstly, I would like to say that I haven’t enjoyed an FM18 save this much in a long long time. Writing this blog has given the save a sense of life and a nerve I haven’t felt in a long time playing FM. I even got up half an hour early this morning to play a bit before going off to work! I hope that you will enjoy reading this as much as I am enjoying writing it. As always, criticism is greatly appreciated! BP play their home games at Grimsta IP, a relatively small stadium situated in a quiet suburban neighbourhood. After some modernization and rebuilding during recent visits to Allsvenskan the stadium now holds 7500 seats. They hardly ever fill up the stadium though, since derby games against local Stockholm rivals AIK, Djurgården and Hammarby are played at the much bigger newly built Tele2 Arena. Grimsta IP is also the home of an outstanding youth department as seen above. Hopefully this will be producing many hot prospects and potential wonderkids in coming years. Basically no money! There’s no real budget to sign any high wage free transfers and it’s absolutely out of the question to buy any decent players. We will pretty much have to settle with what we currently have and with an expensive youth setup we will probably need to sell at least a couple of players to keep some money in the bank. Otherwise, the board will likely try to cut our biggest expense by downgrading our youth facilities, which are the foundation both of the club and the save. In order to avoid that, I am more than willing to make short-term sacrifices in order to keep our outstanding Academy to give us greater opportunities long term. I think of myself as a pretty decent tactician, but I tend to lack the patience needed to tweak a tactic to perfection. When I’m struggling to get a certain tactic to work I usually scrap it and build something completely new. For this season I’ve settled on two tactics that I’ll try to stick with. Firstly a 5-2-1-2 with attacking wingbacks and a more direct style of play. The second one is a more possession-oriented 4-2-1-2. Both tactics using intense “gegenpress” style of defending and an attractive, fast-paced, creative style of attack. This is at least how they are supposed to work in theory. I’ll probably need to do a lot of tweaking in order to achieve the style of play I’m looking for. A pretty well-rounded group of players, but no real household names, right? 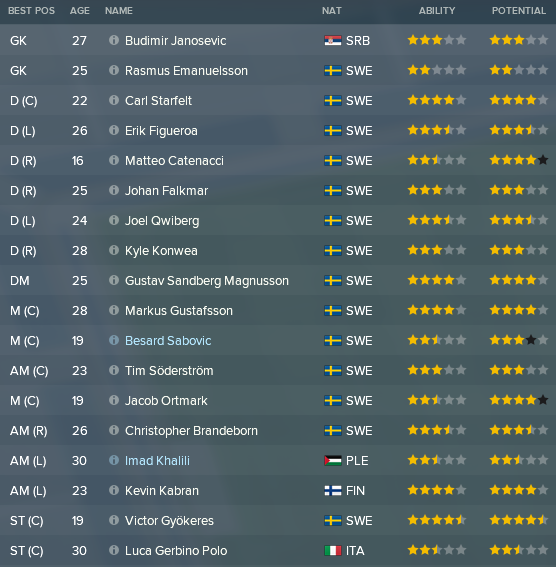 As you can see above the majority of players are Swedish, including Imad Khalili and Kevin Kabran who have chosen to play for other national teams. Most of these players are either BP products or picked up from lower league teams from the Stockholm region. The only exception really is Budimir Janosevic, picked up for free from Serbian Premier League side Spartak before the 2017 season. Italian Luca Gerbino Polo spent 2006-2011 in a variety of Serie C clubs before moving to Sweden in 2012, spending several seasons in the Swedish 3rd tier without making any real impression. 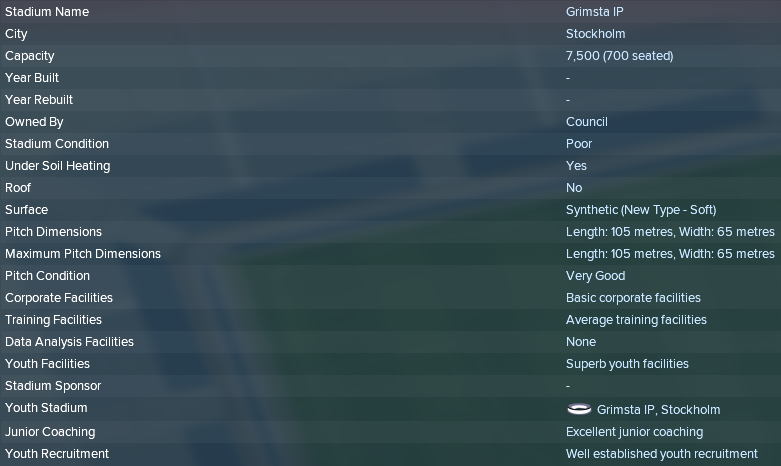 All this changed when he all of a sudden scored 25 goals in 25 games for BP feeder club Akropolis in 2016, resulting in a Brommapojkarna contract for the 2017 season. Two players in the squad are there for season-long loans; Besard Sabovic is a young former BP player loaned back from Allsvenskan side Djurgården. Imad Khalili is a seasoned veteran not getting the necessary playing time in Allsvenskan side Hammarby. I will get back to him shortly. As you can see in the “Potential” column, we have a couple of decent prospects. 16 yo Matteo Catenacci (what a name!) and 19 yo Jacob Ortmark may become possible 5-star players, while 19 yo Victor Gyökeres is already fulfilling his 4.5-star potential at the age of 19. I’ll get back to him soon as well. I’m lacking a few defensive players, primarily central defenders, which I’ll be on the lookout for during preseason. I would also like an additional striker or attacking mid, preferably a decent one that can play in both positions. Pretty unlikely that I’ll find one though, considering the financial situation. Two players stand out for different reasons. One of them for being our best player. The other one for probably being crucial to our preferred style of play. Victor Gyökeres is an aggressive hard working kind of striker. He likes to get forward and he likes to score! A mature player for his age and he will hopefully score 15+ goals in this league campaign. Sadly, he will leave the team for Brighton after this season in a €1.1M deal already finalized before this save begins. Khalili is everything Gyökeres isn’t and vice versa, at least on paper. He lacks both the ability and willingness to run that extra meter. More importantly though, he has the vision, passing and creativity needed for playing as our AMC, a position vital to our creative style of play. At the age of 30, I hope that he will finally perform up to his potential. Seen as a great prospect in his younger years he has never really blossomed, as you can see from his list of recent clubs below. Let’s talk about the kids! As previously mentioned BP are world renowned (at least in Sweden) for their excellent Academy, producing both excellent teams and individual players. The national and international successes and tournament wins among BP Academy teams in modern time are close to countless. For example, the U11 team won the worlds largest youth cup Gothia Cup in the summer of 2017 and finished second in Italian tournament Cirillo, losing to Napoli in the final by penalty shoot-out. On their way to the final they beat teams like Reggina 8-0, AC Milan 2-0 and Atalanta 4-1. The players are technically gifted and the teams always pride themselves in playing a fast-paced technical yet effective style of football. Below is a telling example of the style of play that is preferred at the Academy, showing the 5-1 goal in the 11-3 win against Antony Sport from France in the Gothia Cup final. The build-up play leading up to the 5-1 goal is significant for the BP Academy and something I would be ecstatic if I managed to reproduce with my team. To achieve something close to this vision every outfield player in the U19, regardless of position, will be trained as attacking midfielders. Not necessarily to play as such, but I feel that the set of abilities trained in this regime are the most important in this style of football. Below is a list of our U19 players in order of potential ability. The star rating is based upon the current level of the club, meaning that none of these players are world-beating wonderkids, but the 4.5-5 star potential players are at least good enough to, in a near or more distant future, fight for a spot in the senior squad and therefore interesting enough to be looked at individually. I will also make predictions about future development and importance for the team. Kresojevic is a fairly well rounded central midfielder. A hard-working player, perhaps lacking a bit of creativity. I will have him tutored to increase his concentration and determination. Prediction: If he can strengthen his weaknesses I see him as a potential starting player. Antonsson has nice physicals and mentals, but technically he’s quite far away from the levels needed to play in our AMC position, even though he has a nice first touch and decent flair and vision. Prediction: He will need a lot of training, but being fairly determined he might develop enough to earn himself a place in the senior squad. Vestin is a nice clever little keeper with decent technical abilities. He will be working hard on his physical attributes and will need tutoring in order to strengthen his mentals. Prediction: Considering the current quite weak goalkeepers in the senior squad, he might get his chance sooner than later. Hammar, at the tender age of 15, is a player with all the technical abilities of a good defensive midfielder. However, I have great doubts that he will be able to use these abilities considering his total lack of mental abilities and strength. Standing at 169cms and 53kgs the risk is apparent that he will be eaten up and spit out by senior opposition in the fight for the land of the midfield. I will try to tutor him extensively and see what happens. Prediction: Nice potential, but quite far away from senior football as of now. Matteo Catenacci. Again, what a name! At least for me the name brings up mental pictures of a rock solid yet stunningly beautiful Italian libero from times long passed. My Matteo looks like a decent wing back with good stats in the important defensive areas of heading, passing, tackling and pace. On the other hand, he is seriously lacking in his mental stats as well as most of his technical and physical stats. Prediction: At age 16, he will immediately be at least a temporary senior squad member because of a lack of both right backs and money, but he will need to seriously improve to become a player for the long run. Lorshag is a smaller version of Victor Gyökeres in every aspect, physically and technically. He looks like a natural goal scorer, with nice pace and great finishing and flair. He also has some decent mentals including determination, composure and teamwork. Prediction: He is a bit lacking in the physical department and will also need a bit of work on passing and vision, but I have high hopes of him becoming at least a starting man in coming seasons. Groundstroem is pretty similar to Hammar. Better physical abilities, worse technicals and equally awful mentals. Prediction: At age 17, he’ll need to seriously step up his game in order to receive a senior contract in a few seasons time. Erdogdu looks like a versatile defender. Nice physicals to build on and decent mentals. Still lacking a bit technically, both in the defensive and offensive departments, but hopefully this is something he’ll improve nicely with the current training regime. Prediction: Too early for a certain evaluation, but he will probably be given at least a couple of seasons to give him a chance to develop. Since losing to Division 2 (4th tier) team Piteå IF – before the save started – in the final qualifying round of the Swedish Cup we missed out on the group stage, which gave us the opportunity to focus on implementing our new tactics through plenty of friendly games. I chose to temporarily promote our best youth players for the pre-season to increase squad depth and also give them a chance to test their skills against senior players. I also invited quite a few trial players. We basically played a game every three or four days, rotating heavily. After the initial game against our U21s we played eight non-league teams to increase both tactical awareness and confidence. Two things became apparent during these games; firstly, our main tactic 5-2-1-2 worked wonders against inferior opposition. Secondly, Victor Gyökeres, our young star, demonstrated his importance by scoring in every game he started, netting 7 (seven!) goals in his first two games. We failed miserably to stay competitive when we faced our first real test, Finnish league runner-up HJK, losing 0-2. In all honesty though, we started a heavily rotated team with four trial players. In the final preseason friendlies we managed three good results by beating BK Forward (3rd tier) and IK Brage (2nd tier) and drawing to Premier Division side Djurgårdens IF in front of 7500(!!!!) spectators. Djurgården came to our home ground Grimsta with an impressive following of 6800 fans. I must say that I am really happy with the results and I have also managed to get at least the 5-2-1-2 tactic working ok. We still struggle to create clear-cut chances when switching to the 4-1-2-1-2, but I might use that one for closing out games, since we nearly didn’t let in any goals either. We did manage to get the tactical familiarity up to a level that makes me feel that we’re ready to start the proper season. Most of the trial players visiting us during the pre-season were rubbish or too old for us or both. We did manage to sign a really exciting Brazilian and a couple of defensive backup players, so I’m reasonably satisfied going into the new season. Welcome Léo Paoli! In my opinion he’s a very exciting player at our level and I think he will complement Gyökeres well up front. Never having played a single senior game at the age of 21 and not speaking the language are two minor concerns. I hope that he will speak the language of football well enough to help us earn promotion! In the next episode we will look at predictions for the upcoming season in Superettan and also review the results from the first half of the league. Will we be in contention for the promotion spots? Have any of our young talents made any significant improvements and now look like the new Messi? Read the next episode to find out!